Keep up to date with live Foreign exchange prices around the world, 24/7. 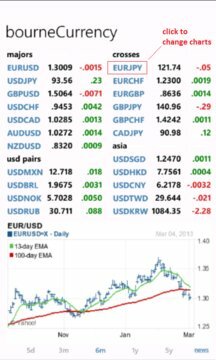 View the latest news stories by currency pair or chart historical prices for over 20 currency pairs (majors, major crosses, Asian and Eastern Europe. This app perfectly complements bourneEquity, our US stock market app and bourneCommodity. New Feature - tap currency pair to change chart.